The 'pal list' contains several elements. This area shows a list of all of the rooms that you are currently visiting. Depending on your subscription you can be in up to 5 rooms at once. You can quickly change between rooms by clicking on them here. If you leave a room it will be removed from the list. Please note that the active rooms area does not show if you use multi-window mode. When you have open message panels open, the list of open panels is listed here. You can quickly change between message panels by clicking on your pal's name in this list. You can clear the list or set how long to keep messages displayed there by clicking the 'recent' header. This is where you see your list of contacts or 'pals'. You can click on the 'online' header to set 'show all pals', or only those who are online. You can see various status messages associated with your pals. You can see if they are online, away, in do not disturb mode, or offline. You can see a thumbnail of their profile picture if they have uploaded one (unless compact mode is enabled), and you can even see what room they are currently visiting if they choose to show it. Click on 'Home' for easy access to all aspects of your Paltalk life. Get a subscription, edit your profile, set up your own chat room, buy credits, etc. If you are using 'multi-window' mode, clicking on 'Home' will launch a separate window. Click on 'Rooms' to open a list of chat rooms that are currently open on Paltalk. 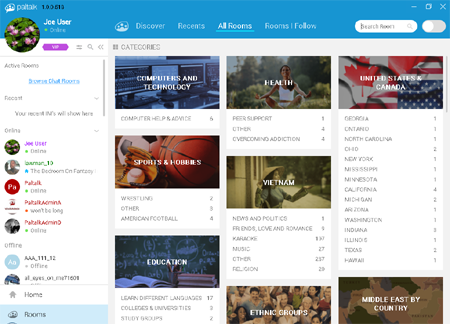 You can view all rooms, rooms you follow, recently visited rooms, or discover rooms that Paltalk thinks you may like. If you are using 'multi-window' mode, clicking on 'Rooms' will open in a separate window. Displays a list of the people who send the most Paltalk gifts in the past seven days. You can see a list from people in your region, people on your pal list, and a list that shows all users on Paltalk.